We were anchored in Whites Bay, Middle Island of the Percy Isles, hiding from a surprisingly strong nor’wester. The forecast was for another change, this time from the south, blowing a healthy 15 knots directly into Whites Bay some time between 22:00 and 04:00. The dual attraction of a decent sailing wind and getting out of the bay before the swell started, saw us going to bed early with the intention of leaving as soon as the southerly change came through. The change woke me at 03:30, and seemed to contain rather more wind than forecast, up to 20 knots inside the protection of the bay. Still, the developing swell was rapidly making it too choppy to sleep so we decided to stick to the plan. After a quick breakfast on deck to acclimatise our eyes to the darkness, we motored out of the pack of sleeping yachts and into the Percy Islands tidal race which was, for once, running with us rather than against us. The southerly wind was working against the incoming tide to build some pretty big waves, and we had a bouncy time getting out of the group. Once out into the open sea, the wind ramped up to over 30 knots, officially gale force. With triple-reefed main and our cruising jib, we soon found ourselves creaming along at over 9 knots. The log records a maximum speed of 9.54, the fastest that we have ever gone. Since we were moving in a straight line, we thought that we may as well throw the trolling line over the stern. This line has a long history. Several months ago, Bronwyn decided that she wanted to learn how to catch fish, and we made a deal that if she can get one on board, then I’ll kill, clean and fillet it. Since then she has been chatting up fishermen and pestering tackle shop owners in an effort to find out the easiest way of catching our supper. It was surprisingly difficult to get a straight answer. Most of them said “Ah, you just throw a line over the back and you’ll catch something. No worries”, but when you actually tried to pin them down for some specific advice, such as “What line? Which lure? How deep?” they would often as not change the subject or offer wildly divergent advice. My theory is that since it is regarded as quintessentially Australian to be born with a fishing rod in one hand and a barbecue spatula in the other, it is not manly to admit that you’ve never done either one or the other. Certainly when I announce that I have never fished in my life, I attract pitying stares and an embarrassed shuffling of feet. Much better for a woman to do the asking. Bronwyn did eventually manage to find a couple of guys who seemed to know what they were talking about, and by May had put together a dream kit of all the tools necessary to catch, land, and process a small tuna. Since then we’ve tossed the gear over the back whenever we thought about it, but never got a sniff of interest. Back to the story. There we were, screaming along in excess of seven knots in gale force winds, alternately burying first the gunwales and then the bow into mountainous swell. Naturally this was the moment that I glanced back into our foaming wake and saw a large fish tail-walking at the end of our line. We had repeatedly memorised all the necessary steps for landing our first fish. After making sure that the hook is firmly set, we were supposed to stop the boat. Yeah, right. The obvious solution was to heave-to, but in these conditions this simply meant that we were making six knots backwards instead of nine knots forwards. Still, the important thing was that while hove-to we could forget about steering for a while and concentrate on the fish. 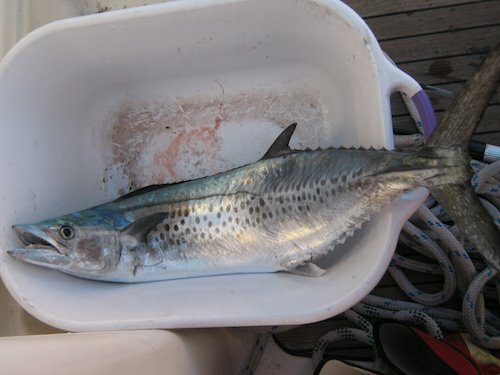 With four pairs of hands we managed to land a rather spectacular Spanish Mackerel, some two thirds of a metre long and weighing about seven kilos. We were quite impressed! Now we had to quickly regain control of the boat before we ended up back in the Percy Isles; in the excitement we had gone backwards for over four miles. Back on our beam reach, we shared our bucking and heavily slanted cockpit with a washing-up bowl full of salt water and a very large and slippery dead mackerel. By the time we reached the Guardfish Cluster, our feet were soaking wet with a lingering fishy smell, but our mackerel was intact and, thanks to a swaddling tea-towel, relatively cool. As we approached the first turn inside the Cluster proper, I again glanced out of the stern and spotted a young humpback whale practising a series of launches out of our wake. Beautiful. Once we were safely anchored between the drying shoal and the rocky reef, I hauled out our shiny new filleting knife and reduced the mackerel to four enormous fillets. Three went in the fridge, and the fourth we had for lunch, gently heated in a little olive oil. It was sweet, succulent, and absolutely delicious. This entry was posted in Australia, Oceania, Travel, Voyage of Pindimara and tagged Gale, Percy Islands, Sail on 2009/07/03 by Reinhard.